Drivers of company vehicles are 25 per cent more likely than company drivers using their own vehicles to have a minor accident, according to a recent survey by IAM Drive & Survive. When asked about car park bumps and minor scrapes in a work vehicle versus a personal vehicle used for work, it was found that 63 per cent of such accidents occurred in a work vehicle – just under two thirds. In addition, 17 per cent admitted they were more likely to speed when driving for work, compared to 11 per cent of people when driving for leisure purposes. Of the respondents only 31 per cent said they didn’t speed at all. The survey also found that driving in a fuel-efficient manner was more of a consideration in private vehicles, 73 percent, compared to a work or company vehicle at 60 per cent. The survey, conducted on Springboard UK, asked about business use of vehicles, excluding commuting. It also studied attitudes to vehicle maintenance in both company-owned and private vehicles. While between 54 and 61 per cent of those surveyed regularly check essentials such as tyre pressures, windscreens and fluid levels when driving a personal vehicle, those same checks dropped to between 20 and 26 per cent for those driving company vehicles. Those who admitted to rarely or never checking their vehicle gave a variety of reasons for the lack of regular checks. These included a reliance on the vehicles’ warning systems to alert them to problems, waiting for annual servicing to highlight issues, or that in some cases it just never occurred to them to check. 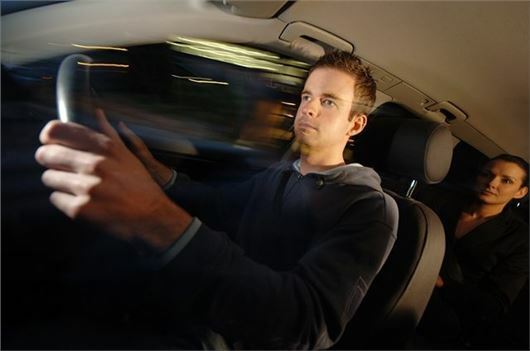 People driving for work are involved in an estimated third of all fatal and serious accidents. In addition to the human cost, poor driving also has a large impact on fleet operating costs, from increased fuel consumption and insurance premiums, to a reduced residual value of the company cars. IAM Drive & Survive’s chief executive Simon Best, said: “While many of those surveyed were careful drivers, we were concerned to find that just under a third recorded little or no concern for any damage to their company vehicle and that only a quarter of those using their vehicles for work consistently obeyed speed limits, compared to 39 per cent in private cars. “Our findings have highlighted a serious disconnect between the driver and their level of responsibility for the vehicle they drive. It seems that not owning the vehicle reduces the driver’s desire to use it in the safest and most fuel-efficient manner, as well as distancing them from the responsibility of checking their vehicle is road worthy.